Spray Nozzle Engineering has recently released the new Liberty 75L portable foamer from Lafferty Equipment, a foamer designed for use with ready to use chemical cleaning agents. 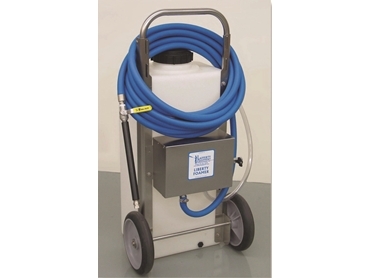 Featuring a heavy-duty, non-pressurised, polyethylene tank and all stainless steel cart and enclosure, these portable foamers are highly durable and easy to maintain and repair. The cart can also have 10" wheels fitted for increased manoeuvrability and durability. The foam adjustment control on this portable foamer is mounted out of sight to minimise unauthorized or unnecessary adjustments, and the included 12m discharge hose assembly features a stainless steel ball valve and both a fan nozzle (for quick foam coverage) and a zero degree nozzle (for extra foam throw distance). Simple to operate, and easily adjustable for foam consistency, the Liberty 75L portable foamer can provide the user with a range of foams, from wet, clinging foam, to dry, shaving cream foam. The Liberty 75L portable foamer gives approximately 16 minutes of foaming time between refills, but is also available as a ‘low-flow’ model which requires less foam volume and extends foaming time to approximately 33 minutes between refills. Both the Liberty 75L standard portable foamer and the Liberty 75L low-flow portable foamer are available as wall mounted units.